You’ve got to tip your cap to the folks at Island Packet. They know their market. 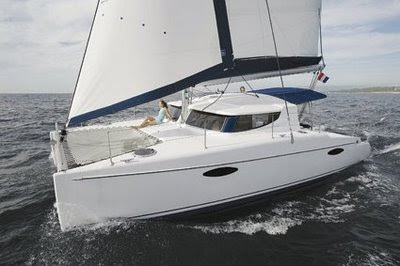 If you’re looking for a lightweight, fin-keel cruising boat with a sporty feel and a big cockpit, there are many to choose from. But if you’re looking for a new solid, moderate-displacement, full-keel cruising boat that will look after you, chances are an Island Packet will be one of the few boats on your very short list. I put the newest model—the 46-foot aft-cockpit IP 460—through its paces in perfect conditions off Hingham, Massachusetts. Here’s the skinny. The solid-fiberglass hull is built with hand-laid knitted triaxial fiberglass fabric and proprietary gelcoats and resins that workers meticulously apply with pressure-fed rollers. This production system reduces styrene emissions and ensures excellent layup saturation. Both the hull and the deck are coated with Island Packet’s proprietary gelcoat system, PolyClad 3, and vinylester resin is used in the laminate for osmosis protection. The lead ballast in the full keel is encapsulated (not bolted on), and the build quality is high throughout. I said the 460 is an aft-cockpit boat, but that’s not entirely accurate. The cockpit is set just far enough forward of the transom to make space for an aft deck that many cruising boats of this size don’t have. It’s wide enough to stow a small dinghy (a great feature for any offshore cruising boat), provides a cavernous lazaret (ditto), and is a great spot for sunning. The backs of the cockpit seats are tall, the seats are long, and bracing points are where they should be. 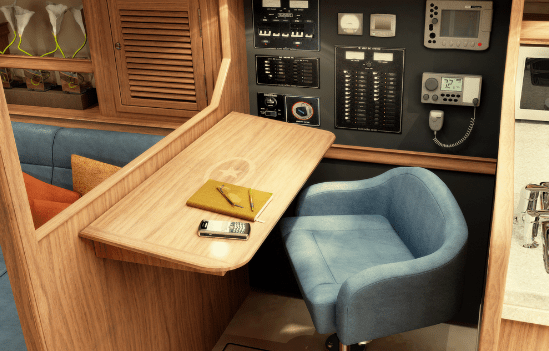 A comfortable seat directly behind the helm and equipped with a back rest completes this offshore-ready zone. You have to step over the broad coaming to reach the cockpit from the stern, but in general, it’s pretty easy to get around on this boat. The wide side decks make it easy to go forward, though you’ll have to step around the shrouds and the foredeck is a bit cluttered by the jib boom. All sail-handling lines are led aft, and the genoa and staysail are set on furlers, so the main reason to go forward will be to deal with the ground tackle. With a pair of beefy anchor rollers mounted on a short bowsprit and a deep, well-executed anchor locker, the anchor-handling system is first-class. Nobody buys an IP to have the fastest boat in the club. IPs appeal to sailors looking for the feeling of sturdiness when they step aboard and excellent manners in wind and waves. And for many the most important feature is a roomy, classic, comfortable, and functional accommodation plan. The 460’s layout is traditional for a reason—it works. Long, straight settees form excellent seaberths and will accommodate six to eight at a beautifully inlaid expandable table in the saloon. 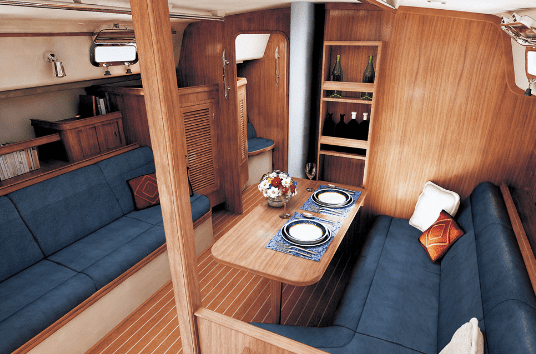 The starboard settee also pulls out to make a double berth. The joinery is top notch. The owner’s cabin forward has an angled double berth (a partial walk-around) as well as copious stowage, a comfortable sitting area, and—the pièce de résistance—an enormous head and shower stall, just like home. 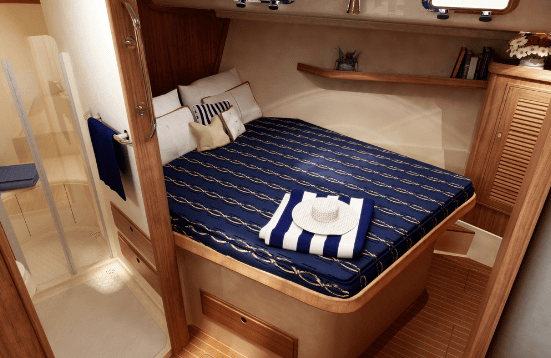 Guests are well served in the ample aft cabin (big double bunk, good stowage). Several other important features to note: The excellent nav station could be aptly called the command center. The galley has generous counter and stowage space. The saloon sole is real teak and holly, not the laminate that many builders are now using. And the molded anti-skid surfaces in the galley and at the base of the companionway are great to have offshore. 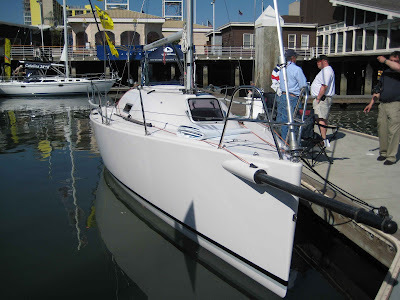 We had all the sails (in-mast-furling main, genoa, and staysail) flying for my test. Wind speeds varied from 10 to 15 knots on the flat water of protected Hingham Bay. The boat cut an arrow-straight wake and had no trouble putting her shoulder into the puffs. The puffs would come, we’d heel a bit more and then slowly accelerate. We had some instrumentation/transducer funkiness, but the dealer and I estimated our top speed at about 6 to 7 knots. Tacking with the self-tacking jib was a simple put-the-helm-over exercise, and tacking angles (without pinching) were a shade under 90 degrees. There was no slop in the Edson rack-and-pinion steering system, though the helm feel was a bit husky. The 75-horsepower diesel, three-blade fixed prop, and bow thruster made short work of backing out of the tight marina slip. Even a full-keel boat can be maneuverable with the correct setup. Cruising speed under power was about 7 knots over the ground, and the engine didn’t appear to be working hard. Sound levels in the saloon were sufficiently quiet. I’d have no reservations about going offshore in this boat. For cruisers who don’t relish getting bashed around, or having to reef in 14 knots of wind, or spending their watch hand-steering for an extra tenth of a knot, and who want the load-carrying ability to take (most of) what they want with them, the 460 has what it takes. How is the motion compared to similar fin keeled boats? What kind of speeds would you expect from this boat? Great video. Do you lose any performance or sail life with vertical battens?